Warwick Students Union describes itself as the central point of campus life at Warwick. As a charity, they use all the money they make to improve their services. digitalsignage.NET was an investment meant to enhance communications and generate additional revenue for the Union. Five digital signage networks powered by digitalsignage.NET were installed by our partner Chamber TV. By combining digitalsignage.NET with Chamber TV’s online IPTV channel website, the Union was able to launch an on-screen, on-line, on-mobile communication with its students and create their own personalized media channel. 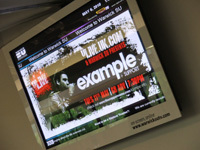 Warwick Students Union uses digitalsignage.NET to display social media news (tweets and Facebook updates) as well as YouTube videos or their IPTV channel on digital displays across the building. 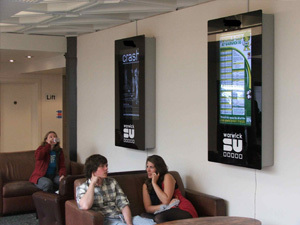 Using one of the several Templates within digitalsignage.NET, the Union is able to share complementary information simultaneously on the same screen, thus maximising its utility. This feature allowed it to display third- party advertising along with their communications and generate extra- revenue for their establishment. The digital posters powered by digitalsignage.NET became part of the Union’s 3- year business plan involving generating ROI through advertising. See what digitalsignage.NET can do for your school by testing it for free. All you need is a MAC or a standard PC. No obligations, no credit card required.